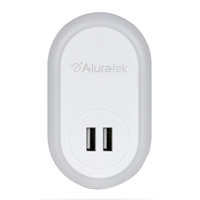 This LED Nightlight from Aluratek contains Dual USB Charging Ports making it the perfect night light and double up as a USB charging station with its two USB charging ports. Whether it is for your home or travel, do not worry about bringing your phone charger because this takes care just that. Simply plug this in to a power outlet, and plug in any USB cable to start the charging process with your devices. From iPads, iPhones, Samsungs, to other devices, you can charge them simultaneously without waiting for the other. The plug in nightlight serves great as a kids nightlight, a bathroom light and everything else in between. It has a simple yet sleek design so it will go with any room decor.